As I mentioned a few weeks ago, Jonathan and I read the companion titles, Every Man's Marriage and Every Woman's Marriage . Since this pair of books is obviously set up to be read independently by the husband and wife, Jonathan and I did that, and are sharing our thoughts as a team on the respective titles. "God designed the institution of marriage not just as a means to our happiness but as the very foundation of society. Marriage isn't a temporary agreement made for our convenience or selfish intentions. It is a lifelong, blood-sweat-and-tears, come hell-or-high-water commitment. When we marry, we pledge our entire lives to our spouses, "for better for worse, for richer for poorer, in sickness and in health, to love and to cherish, until we are parted by death." I think one of the hardest things for me to realize, the further in we get into our marriage, is that the world really seems wants to pull us apart. I wouldn't say that I entered into this "blessed state" (which, for the record, it is!) with blinders on. I didn't expect it to be easy. I just didn't expect it to be torn at by outside forces as much as it has been. That's a hard road to walk and it takes fight and effort to keep going with it and to take care to protect it. When Ethridge says that marriage is something that you hang on to "for dear life" - she wasn't kidding! The encouragement that this book offered was welcome along with the conviction - to keep pressing on and honoring my relationship with Jonathan above all others. Books which focus on helping married couples overcome the hurdles in their communication styles, so that they can understand each other better and operate more effectively as a team. These issues are still often addressed from a Christian perspective, and a great example is The Five Love Languages by Gary Chapman. 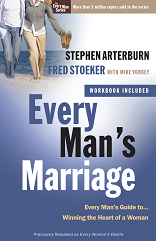 Every Man's Marriage is a blend of the two styles, and covers a very broad range of subjects by multiple authors as you progress through the book. The positive side of this is that the broad focus is likely to hit on a great number of issues that are relevant to your marriage. 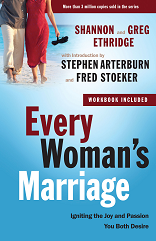 But, on the other hand, it doesn't go into extreme depth for any given subject, and it reads like a general Christian handbook to marriage concepts, pitfalls, and encouragement. Personally, I've always had a penchant for reading marriage books... I recall reading them even before I was married or was in any kind of relationship. In retrospect, that really wasn't particularly useful! A bit like reading a tour guide to a foreign country you don't have any plans to visit. My personal challenge now is that I enjoy reading books like this, nodding sagely at their advice, wincing a bit when they hit too close to home, and feeling silently smug when the authors share self-deprecating anecdotes from their own marriages where I feel like I could honestly say, "Well, even I wouldn't make that mistake!" But, by applying that kind of attitude when reading books like this, and then moving on and living my life, there is really no benefit to be gained, and I may have just as well spent the time reading a good novel instead. Because, truly, purely academic knowledge in the area of relationships is not much use at all. For example, a year ago I subscribed to This Old House with every intention of becoming inspired into lots of grand projects about our house and yard. Today I just received the last of my 12 issues in the mail. Each month I enjoy paging through them and seeing different ideas, construction projects, and what appears to be an inexhaustible variety of ways to use power tools! Now, a year later, I'm a lot smarter for it, and I can toss out complicated-sounding terms like "mortise and tenon" with wild abandon. But, how many homeowner projects has this actually prompted me to take shovel in hand and go after? A big fat zero. Because, even though the glossy magazine photos of promised outcomes look fantastic, I know that there's a big difference between sitting in an armchair reading a magazine, and roto-tilling ground and pulling weeds under the hot sun! Our land will probably have to survive with the bare minimum of attention for a good long while. (Retirement, maybe?!) I don't think I'll renew my subscription. It's tempting to apply a similar attitude to our marriages, and just stay on "survival mode", where we do the equivalent of keeping the grass cut before it gets knee-high and, well, if the drywall gets banged up somehow, just hang something colorful over it! But, let's not just read these books for educational purposes; it's better to take a few sentences and begin applying them consistently in our lives, than to read entire books and stuff them into the back of our "mental knowledge" where they may never see the light of application. When the going is rough, we are forced to look to the cross for our strength and motivation to continue. “This is how we know what love is: Jesus Christ laid down his life for us. And we ought to lay down our lives for each other.” (1 John 3:16) The rewards of this are reaped in more than just the lifetime of marriage ahead of you; they are to be enjoyed for eternity! Some good news for all of you. The publisher - WaterBrook Multnomah Publishing Group - has offered to give away a set of these books to one of you! Would you like to win these marriage resource books? Getting married soon? Been married and realize it's a struggle sometimes to keep plugging along? Simply leave a comment below. This contest is open for U.S. Residents only and will be open through Wednesday, the 19th. Well, as convicting as your reviews were, I think the books would be even better. Our seventh anniversary is at the end of June. Even if I don't win the set, I think I will consider getting them as a gift to honor our marriage. Or at least if we don't read them like a novel. I thoroughly enjoyed these reviews--made me chuckle! And I concur, after more than 17 years of marriage--there are forces trying to destroy each individual marriage and we must keep working at it to be successful. Thanks for the review. Please include me in this drawing. Thanks. I think I'll have to check out those books. Thanks for your reviews. I always enjoy your reviews. I would love the books! Would dearly love to win this for my niece who is getting married early August! My husband and I did a Sunday School class on these books, so we already have them...I just wanted you to know that we posted about your giveaway at Winning Readings. I would love to win these. They sound terrific. I don't think any marriage is immune to trials and frustrations and working together to strengthen our marriages is so important. A double yes yes to this dual giveaway! Always looking for way to better our marriage. Please enter me. I would like to give these to my son and his wife. I'd love to read this :) *Thanks* for the giveaway! We've been married 17 years but I think they would be great books for any married couples to read. Our 13th anniversary is Monday. Marriage is indeed a lot of hard work and sacrificing personal desires and needs. Anyone who says it's easy or should be easy doesn't know what they are talking about!